It is the year 2013. The danger of the aliens invading for a third time is ever-present and still dominates life on Earth. In search of the one chosen warrior who has what it takes to save mankind we’ve pitched our boot camp at the world’s largest interactive gaming and entertainment event: Gamescom. For the next five days, about 300.000 of the most talented warriors of the most diverse backgrounds will meet here. Our administration includes 12 carefully selected commanders of the International Fleet (short: IF). 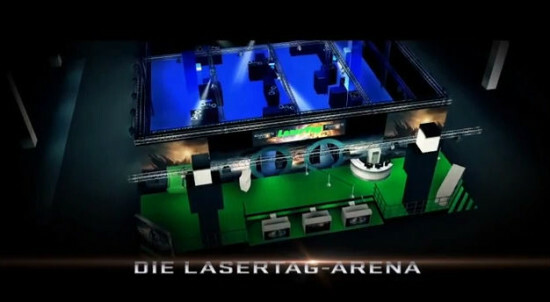 Our boot camp has been equipped with a gigantic laser tag arena. Here, we test the abilities, the strategies and, most importantly, the courage of our soldiers. Since there is likely to be a large crowd, we offer you the chance to register (for free) for a fast lane pass, which will grant you preferential treatment when it comes to participating in the Great Game. Prove your abilities! This is your chance. Build your army and register now at Facebook/Endersgamefilm. The next report from Gamescom will be uploaded tomorrow at noon. Ender’s Game. In Cinemas from October 24. And if that’s not cheesy enough for you to be thoroughly entertained, here is a fun fact: the guy saying these lines is the German voice of Robert de Niro. It is the year 2013. The danger of the aliens invading a third time is ever-present and dominates life on Earth. You are our last hope to find the chosen warrior, one who knows no fear or mercy. Have you got what it takes to be a hero? Ender’s Game – The Laser Tag Challenge. Prove yourself in the laser tag arena only at Gamescom 2013 in Cologne. Build your team and register on Facebook/Endersgamefilm. This looks effing awesome! And to imagine that for most of the year I live only about 2 and a half hours from Cologne, and I still couldn’t make it …. So, what do you think of the laser tag challenge? (Or the dramatic prose, for that matter.) Share your thoughts in the comments!